Sharyn Chan is a unique blend of scientist, artist, hip-hop dancer, and a motorcycle racer. Currently, she works as a street artist, solo and as a part of Tracy Lee Stum’s Team 3D, and as a hip-hop dance instructor as well as a government contract project manager. She was born to be an artist: drawing illustrations of rabbits and bears at age 3, but her career path took a different turn in college where she graduated with a computer science degree and stayed in that field for 30+ years. She dabbled in the artistic side of computers diving into Photoshop and graphic arts on the side, but, it was not until she met world-class street painters at Santa Barbara I Madonnari in 2001 that she learned about the ancient art form of street painting. 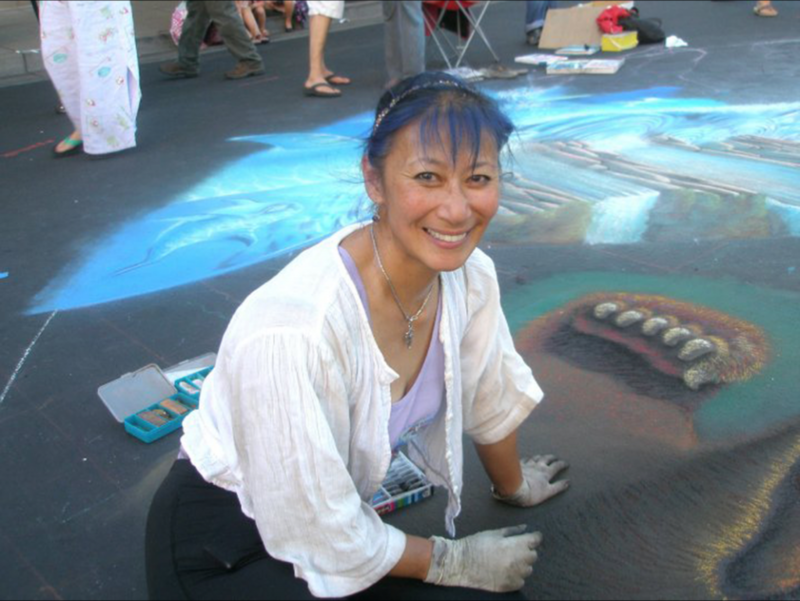 Rekindling her passion for art, Sharyn began street painting in her hometown of Santa Barbara and has traveled all over the world participating in festivals and street painting to her heart’s content. Her favorite subjects tend to be animals: large cats, fish, birds, however, recently, I have been combining fish with dancers. Chan’s favorite thing about Chalktoberfest is my fellow artists and of course the fantastic hospitality of Sally and her crew.